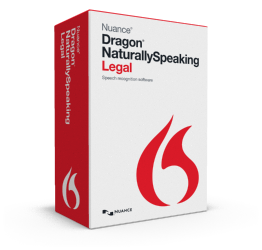 Dragon NaturallySpeaking 13 Legal is speech recognition software designed specifically for the legal industry. An enterprise-ready solution, Dragon Legal enables attorneys and other legal professionals to get more done on their computers — quickly and accurately — using their voice. Dictate, edit and format legal documents, send email, manage schedules, and search the Web — up to three times faster than typing. Streamline third-party review and correction, automate business processes, and control applications via voice commands for faster document turnaround, reduced transcription costs, and increased efficiency organization wide. Stop typing, start speaking — and start doing for new levels of productivity and profitability. Dragon 13 Legal includes a special language model to help you achieve optimal out-of-the-box accuracy when dictating legal terms. To further increase accuracy, you can create, import and share custom word lists that are relevant to your clients and areas of specialty. Dragon also enables you to format legal citations automatically and leverage third-party correction features to speed document turnaround and free support staff to focus on higher-value tasks. Dragon 13 Legal provides security features, configuration options and administrative tools that make it easy to manage voice profiles, custom vocabularies and commands, feature access and multiple installations over a network. Administrators can obtain a recognition log file for each end-user, enabling them to gather rich, objective usage information. They can use this information to provide targeted advice for improving recognition accuracy and to measure return on the solution investment. Dragon 13 Legal is Section 508 certified, enabling you to meet government-mandated accessibility requirements for workers with disabilities. It also helps prevent fatigue and repetitive stress injuries and keeps more employees on the job by offering a comfortable, ergonomic alternative to the keyboard and mouse. Dragon Legal’s Auto Transcribe Folder Agent manages transcribed text and synchronized audio flow of digital voice recordings — producing text, Microsoft Word .DOC and .RTF files — to streamline third-party review and correction. A Roaming User feature supports dictation and third-party correction from different network locations while ensuring centralized control of master user profiles. Dragon automatically updates the appropriate voice profile — no matter who corrects the transcribed text — to deliver improved recognition accuracy over time. In addition, administrators can set up automatic email notification to alert users when a transcription job is complete. Record notes — anywhere, anytime — while they are still fresh in your mind to produce more detailed reports, proposals, meeting minutes and more. Dragon Legal supports a Nuance-approved digital voice recorder for advanced recording functionality or the free Dragon Recorder app on your compatible iOS device. Dragon will automatically transcribe the audio files to text back at your PC. Dragon Legal’s vocabulary editor makes it easy to personalize your vocabulary to include acronyms, proper names and other unique or business-specific phrases that you frequently use for increased recognition accuracy and fewer corrections. In addition, you can import, export and share customized vocabularies across the enterprise. With Dragon Legal, it’s quick and simple to create custom voice commands to quickly insert frequently used text and graphics. This feature lets you insert email signatures, logos, graphics, boilerplate text and more just by speaking a simple command for significant time savings. Dragon’s text-to-speech capability is a natural-sounding synthesized voice that reads designated text to you, thereby simplifying proofreading and supporting new levels of multi-tasking. With Dragon Legal, you can also listen to audio playback of your own dictation with the associated text highlighted on the screen. Reading four minutes of text is no longer necessary—Dragon 13 is already accurate right out of the box. You can also go back later to read text to further train Dragon if necessary. Dragon 13 no longer asks you to adapt its vocabulary based on documents and emails during profile creation. If you wish to launch the analysis later, you have that option. Dragon 13 is not only fast, but it is 15% more accurate than Dragon 12. By leveraging the latest advances in speech recognition technology, Dragon 13 delivers more accurate results, enabling users to be even more productive when working on their computers. Dragon 13 supports microphones built into many of the latest laptops for optimal flexibility and convenience. You’re now free to dictate documents and speak commands directly into your laptop without using a headset. Dragon 13 supports popular web applications in all major browsers. It delivers improved voice command and control, including Full Text Control when dictating in Gmail, Outlook® and Yahoo! Mail. DragonBar: The new DragonBar provides clearly indicated controls and automatically collapses when you’re not using it, taking up less real estate on your screen. You can use the DragonBar menu to customize its behavior. If you’re an existing Dragon user and you’re more comfortable using the classic DragonBar, you can easily switch back to it. Learning Center (formerly called the Dragon Sidebar): The Learning Center has been redesigned and enhanced. The top panel, open by default, contains essential commands and advice which automatically change as you switch context to different applications. Interactive Tutorial enhancements: The Interactive Tutorial has been redesigned and augmented. Its short, progressive simulations now also introduce the DragonBar, the Learning Center, the Vocabulary Editor, and important options, as well as basic Web navigation and use of Web-based email. It is automatically presented at the end of the profile creation process. Even experienced Dragon users can benefit from the Interactive Tutorial. Dragon 13 supports dictation with Full Text Control, as well as enhanced Command and Control, with Internet Explorer®, ChromeTM and Firefox®. In order to use Dragon in these supported browsers, you must enable the Dragon 13 browser add-on. Dragon 13 has Full Text Control in supported text fields on the Web including Gmail, Yahoo! Mail and Outlook.com, in the latest versions of Chrome, Firefox, and Internet Explorer 9 or higher, providing an enhanced experience when dictating, editing and formatting. Dragon 13 also has Command and Control for standard Web controls, links, and buttons, including Gmail, Yahoo! Mail, iCloud®, etc. in Chrome, Firefox and Internet Explorer.